This customer favorite is back with a new design! 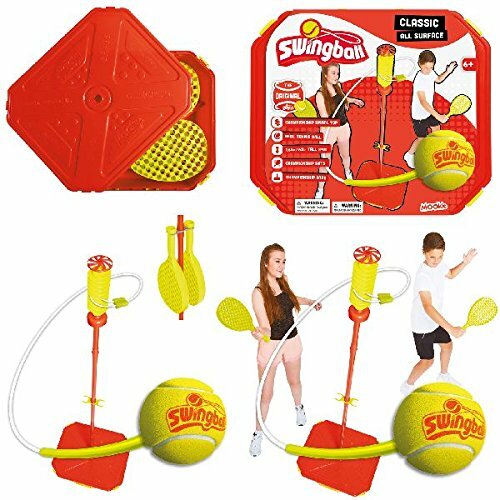 For years, kids have loved our best-selling Super Swingball game. It can be set up almost anywhere, its lightweight carrying case becomes a super-sturdy base when filled with water or sand. Position the base on grass, pavement, or patio, insert the steel pole, attach the tennis ball on its nylon tether, and volley the ball back and forth with "checkerbat" racquets. Tether can be adjusted to spin freely or travel up and down the pole's corkscrew-shaped sleeve. Pole is adjustable up to 5-1/2" H. Set includes: Carrying case that becomes base; Steel pole; Tennis ball; Adjustable nylon tether; 2 "checkerbat" racquets. For ages 6 and up. Size: Carrying case: 16-1/2" x 20''. If you have any questions about this product by HearthSong®, contact us by completing and submitting the form below. If you are looking for a specif part number, please include it with your message.